The GTD® Methodology Guides distill the best practices of GTD into a handy PDF download. The 2019 GTD® Organizer Calendar is built on the GTD principles. Letter size. Learn the GTD best practices and models for seamlessly managing your projects. 5 MP3s. A full-color 11.7" x 16.5" (29.7 cm x 42 cm) GTD® Workflow Map as a PDF download. Our best-practices guide for implementing GTD® with OneNote® for the Windows® desktop. The 2019 GTD® Organizer is a complete system built on the GTD principles. Junior size. Our best-practices guide for implementing GTD® with Nirvana®. 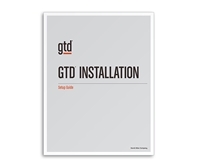 Step-by-step GTD® installation manual with detailed instructions, suggested supplies, and coaching tips. Our best-practices guides for implementing GTD® with the iPhone® or iPad®. 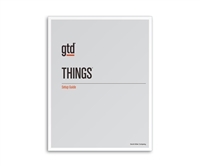 Our best-practices guide for implementing GTD® with Things®. Copyright © 2017 David Allen Company. All Rights Reserved.